Providing you the best range of Bangle Set, Ladies Bangle, Ladies Bangle Set, Silver Bangle, Silver Bangles and Oxidised White Silver Designer Fashion Metal Bangle Set with effective & timely delivery. If traditional dressing is your style, than this ornate bangle by Bindhani is the right pick for you. This mehandi plating is different from gold plating......third particular shade of plating gives a antique look to this piece. Adorn your self or your end customer with jingling effect of this bindhani Set. High quality material is used in manufacturing to avoid seasonal tarnishing. Feel free to give guarantee to your end customer for this product. Bangles are made in Light weight metal which is much smoother, Soft and will protect your skin from rubbing. You will feel comfortable when wearing it. Its wedding traditional style mehandi plating circles for best jingling sound and your complete beautified look. If traditional dressing is your style, then this ornate bangle by Bindhani is the right pick for you. We suggest wearing this gorgeous accessory with a silk saree and a pair of wedges to a festive season. Make your own style statement with is set of bangle. Match it with bindhani earring mang tika set and high heels for complete stylish look. Middle filigree bangle in mesh like structure is the main incing on the cake to flourish your end customers if you are a resale. Versatile bohemian and traditional touch to this ornata of bangle in white silver plating. Spiral snaky binding in corner bangle and middle most bangle is encoded with metal beads. Add this product in your sell list and see the positive effect on your customer. White silver plating stones with all needed finishing on it. Smooth, jingles, trinket for best bohemian look of the day. To avoid tarnishing secure in safe and hygene conditions. Avoid direct contact of chemicals. Competitive price and best metal quality provide you endless trust on your customers. Unique hammered handmade tribal style bohemian armloads of Copper, Brass, Bronze and Iron.....New passion of Bindhani craftsman playing with elements of planets and crafting a quality wearable art which is light weight, in expensive, uncommon touch and do have medicinal benefits. Note:-Make a big room for bangles by wearing sleevless or 2/3 length of sleevs with this trendy set of jingling mehandi plating bangles. This is one of the best selling iconic product of bindhani. Add a jazz to your long skirt and sleevless top with a stole to accentuate the look with this bangle bunch. ! Product Description:-A bunch of twenty bangles with versatile range of detailing and embosed texture of tiny golden beads and perfact jingling effect to give you best statement or trendy look for your head out with friends. 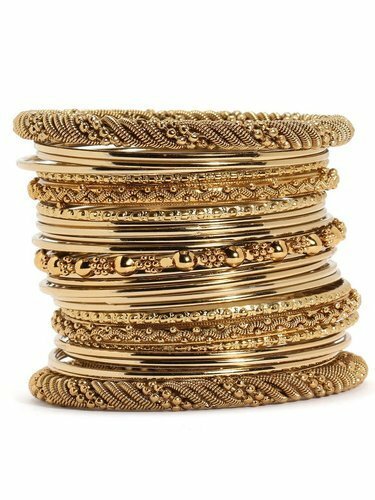 Style Note:-Make a big room for bangles by wearing sleevless or 2/3 length of sleevs with this trendy set of jingling mehandi plating bangles. This is one of the best selling iconic product of bindhani. Add a jazz to your long skirt and sleevless top with a stole to accentuate the look with this bangle bunch. ! Product Description:-A bunch of twenty bangles with versatile range of detailing and embosed texture of tiny golden beads and perfact jingling effect to give you best statement or trendy look for your head out with friends.